It takes clarity of thought and expression to be a brilliant physicist. No less so to be an effective marketer (and/or business owner). If Einstein were a marketer, I think he’d advise you to De-Fog Your Business! I’m all for a well-thought-out go-to-market strategy. But I’ve often advised consultants and other small businesses to leave your directional map at about 80% – and let the market inform you about the remaining 20%. Why? 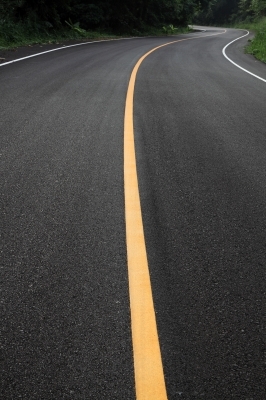 Because you WILL pivot, to some extent – and your customers will show you where and how. 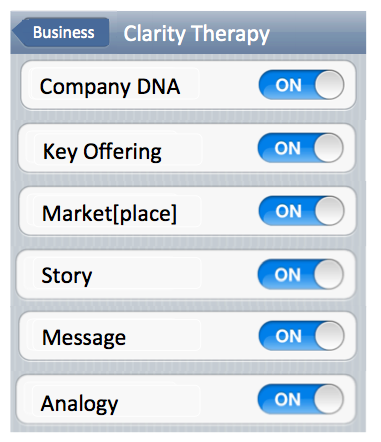 A recent example from my experience – I’ve been doing Clarity Therapy sessions for a variety of individuals and companies for a couple of years now. Typically, these are one-day intensive sessions, with a few months of minor follow-up. I did not, however, anticipate performing any kind of ongoing business coaching. 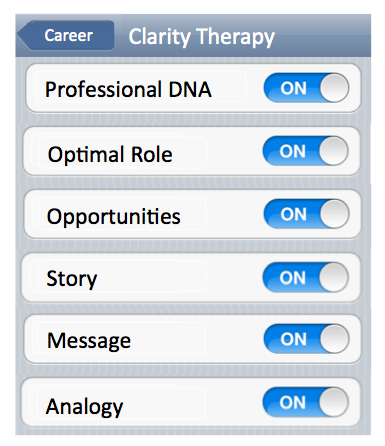 I saw Clarity Therapy as an event, not a long-term process. Until clients starting asking for more. A lot more. And a wealth of helpful lessons from past experience began to come to the surface. Turns out that being an outside voice giving perspective on overall business structure, specific creative offerings, client account management, and staffing (plus identifying resources via networking) is a much bigger need than I realized. The most interesting revelation of all: how lonely it is to be a small business owner or solo consultant. I mean, I knew that, right? I AM one. But it didn’t really occur to me how important it is for us to have an outlet, a peer, a mentor, a friend – who can come alongside for the long-term and help get a business to a new level. There are short-term and one-shot needs, but clients are saying to also think about the deeper, longer haul. Bonus: that approach actually suits me quite well. I prefer those kind of business relationships. Truth is, there’s a lot of stuff we just can’t say to customers, employees, colleagues, even family members. It’s frustrating, and the lack of a healthy outlet and fresh perspective clogs our mind and heart. So, I now find myself offering business coaching for people and businesses seeking to grow and needing outside advice and encouragement. It’s not really a change of direction, just a natural extension that I didn’t anticipate. How about you? How have your customers caused you to pivot? I’ve seen a number of my social media people evolve over time and it’s pretty fascinating. What’s your story? If your company name and tagline could mean a whole bunch of different things to a whole bunch of different people, it’s meaningless. Global Technical Solutions – Where Technology Drives Customer Value. Meaningless. Dwilgoq – It’s on!! Meaningless. The Robert Higgins Group – We mean business. Meaningless. Take a stand! You can’t do everything for everyone, so define your niche and project a clear message. Get out of the fog. I do realize that it is a challenge in this URL-crowded era to find a unique name. But at least try to have a descriptor – a verbal business card – that tells us what you’re about. I interacted this week with Marc Pitman. His title: The Fundraising Coach. The summary he gives of himself on Google+: Committed to making it ridiculously easy for people to find fundraising training. Bingo. I know EXACTLY where to put Marc in the universe of suppliers. But if, instead, his title was: The Business Coach – well, then I’d be unable to place him in memory. If his verbal business card was: I help people find what they need to succeed – despite the cute rhyme, he’d be another MBE (meaningless business entity). It may help you in business to have your MBA. But if you’re working on your MBE, you’re making life far more difficult than it should be – for your customers, and ultimately, for you. You need to Claim Your Market[place]. If you think you’ve got a case of MBE, let’s talk. Maybe a dose of Clarity Therapy is just what you need to get more meaningful. Ping me at: steve at stevewoodruff dot com. Anyone that knows me well knows that I have a passion for writing – in fact, it’s really a passion for all things communication (including speaking, video, social media, etc.). As a blogger, I traffic in a lot of written material. Much of what I see is, quite frankly, pretty amateurish. Writing clearly and succinctly is crucial to work effectiveness. And it’s a rarely-trained skill. It doesn’t matter what position people occupy in their profession. Everyone from the newly-hired salesperson to the CEO needs to sharpen communication skills, if they want to be viewed as professionals (see this recent post by Dave Kerpen). If people are spending an average of 28% of their time dealing with e-mail – then just improving that one area of business writing can return a lot of potential productivity gains! In the past month, I’ve sat down with a couple of great providers who do corporate training on communications/writing skills. I found myself nodding so vigorously during discussions that it’s a wonder I didn’t end up at the chiropractor’s office! As I underscore in my Vendor/Project Success workshops, the basic principles of project and vendor management will be used in all future career areas – just like learning to drive a car, it’s an “evergreen” skill set. Writing and communicating clearly? –even more so. Clear communications lead to clear actions. Foggy communications lead to misunderstandings, back-and-forth clarifications, and frustration. Let’s train ourselves and our people how to effectively move thoughts to the keyboard and beyond (and if you need a communications training vendor/provider recommendation, just let me know – steve [at] connectionagent dot com). It can never be wrong to sharpen this skill! Also, here’s a book recommendation for you. 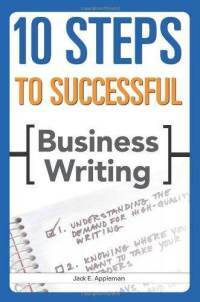 10 Steps to Successful Business Writing* (by Jack Appleman) is a compact, simple-to-absorb volume that gives practical, step-by-step advice on how to write more clearly. 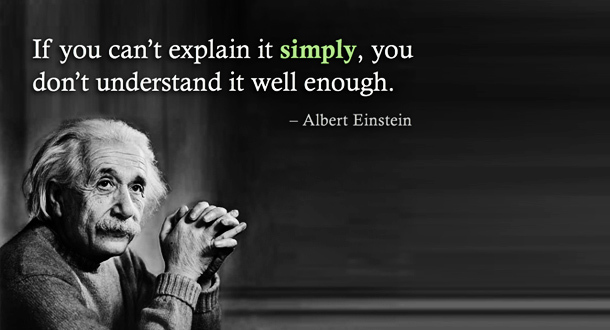 Successful business writing starts with simplicity. The beauty of simplicity is that it can produce results faster. With chapters like Know Where You’re Taking Your Readers; Be Explicit, Clear, and Concise; Grab Your Readers’ Attention; and Master The Documents You Use Most Often; this book dives immediately into straightforward advice with plenty of practical application. I’ve spent a good bit of time with Jack lately (we have a common bond in the realms of clarity and training! ), and he has shared with me how he can also partner with corporations and provide valuable training for employees. If you’re interested in Jack’s services, let me know and I’ll make the connection. Postscript: Just saw this nice summary about how to write effective e-mails that people won’t ignore, by Bryan Garner via HBR blog. There are millions of companies out there providing something-or-other, and millions of people doing some-job-or-other. Don’t be one of them. Claim your market[place]. You have a unique sweet spot as a company, an offering that sets you apart. That’s your [place] in the market. As an individual, you are developing skills and competencies that are shaping you for a particularly “fitting” role. 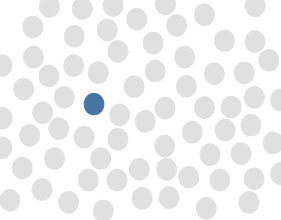 That’s your [place] in the market of work (whether working for others, or self-employed). Your primary job, right now, isn’t winning the next project, or grabbing the next available job opening up the ladder. It’s knowing and defining your market[place]. The best way to find your niche, your sweet spot, is by asking for the honest input of trusted others (including clients and co-workers). Generally speaking, they will see more clearly than you do where you fit. You can also get outside help by way of an assessment and professional counsel. I’ve been doing a lot of Clarity Therapy lately. What is Clarity Therapy? It’s an intensive one-on-one time where we dig deep to uncover your professional DNA, and come up with your unique direction, story, and message. Clarity Therapy is like de-fogging the mirror and the windshield. When we see ourselves and our purpose clearly, we move forward with confidence. <—(click to tweet this). Our goal: defining a you-based business or role. AND – we use M&Ms for props. Because gaining insight should be delicious! If you’d like to learn more, contact me (steve at stevewoodruff.com). I can forward you all the details, and about as many testimonials as you’d ever like to see (from people just like you who wanted an objective “therapist” to help clear the fog). And, yes, we can do these sessions over Skype. You want one huge bonus? Here it is – the clearer your message, the easier it is for people to connect and refer you. Including me, the Connection Agent. Read this series of tweets from the bottom up. Take a look at your website. 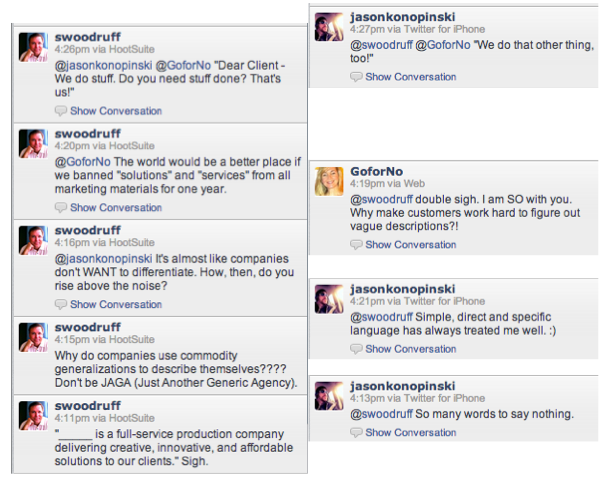 Are you using commodity generalizations that sound just like the next company? Do you want to compete in a noisy marketplace? Here’s job one – Don’t be JAGA! Lift the fog!! !